Even though I have been chasing bass with lures for over 25 years, it was in the final 7 years preparation to becoming a shore based, bass fishing guide, that I fished ‘my’ 120 marks in as many differing wind, weather, tidal and sea conditions as possible – painstaking yes, but definitely worth it. My Blog series Analysis of my bass fishing diary (currently at Part 9 with 3 more to be written later this autumn) scrutinises the hard data that I collected – data that greatly assists me in deciding exactly ‘where’ I guide my clients. Clearly, nobody owns the coastline therefore, when I say ‘my bass marks’ what I mean is that these are areas of coastline where I have built up extensive knowledge, so that I can give my clients the best possible chance, on the day in question, in whatever conditions we face (bar extremes) of catching one of these wonderful sporting fish. These exact locations can be very, very specific. Indeed, my clients will often be casting lures into underwater zones of reef and patches of sand as small as 2m², gullies/inlets as narrow as 4m and even in the vicinity of 1m² depressions/scours set within reef systems. The south Devon coastline is vast and varied, encompassing prominent headlands, remote coves, beautiful estuaries and reef systems that stretch for hundreds of yards. I tend to have clusters of marks so that my clients and I (in the course of my personal fishing) can move with the tide, be it flood or ebb to fish differing types of ground, quite possibly where different lure types are also required. So ‘when’ and ‘how’ do I decide on a particular stretch, considering these marks are spread out over 15 miles of stunning natural beauty? I would say that 70 – 80% of the time, the region of coastline is selected based on the wind direction and strength – this is decided no earlier than 48 hours prior to the session so that I have an accurate picture of the water clarity and wave height. NOTE: – I am extremely lucky here in south Devon in that the water clears remarkably quickly following strong onshore winds. It is also rare that I cannot find a safe, fishable mark for my clients – even late into the autumn and early winter. Other factors that dictate where I will guide a client (s) are: the previous day’s catches and when similar conditions are expected, a client’s fitness or ability to walk long distances, if a client wants to learn a specific skill (for example, how to fish soft plastics over a shallow reef) or the tide times of low and high water – particularly if a client has specified a time of day they can fish due to other commitments. Steve, my client for this session, was eager to experience some lure fishing in darkness, but with the swell (and overall wave height) due to increase markedly during the latter part of the day, I decided a very early meet, in order to fish in darkness into daylight was the way forward. Most importantly though – with the high spring tide peaking at 0843 and dawn at 0610, there was a very specific area (and one excellent mark in particular) that I wanted Steve to fish in daylight – a place where I have experienced some excellent bass lure fishing at first light. The mark in question is very consistent during the first two hours of daylight but rarely thereafter, on spring tides (above 5.0m Salcombe scale), when HW falls between 0800 – 0930 but most importantly – in the sea conditions I was expecting due to the wind strength and direction. Pre-dawn, with a high Moon – Steve targets an area of reef on an otherwise featureless stretch of beach on the first mark. The air had a slightly chillier feel to it as we crunched along the shingle to our first mark at 0415, under a rather bright half-moon – indeed, it hardly felt like night-time. With two hours of darkness available, I asked Steve to work an area of beach (a very large beach as it happens) that would see him casting a lure over a known patch of reef around 30 – 40m out. What is unique here is that the reef, which is around 6m² is surrounded by sand therefore, fish (small ones, and larger one wanting to eat them) are attracted to it. There was a lot of floating weed in the water, which did make things difficult, but with a few adjustments to the casting angle Steve was able to fish relatively comfortably. Moreover, with a 2 – 3ft swell running (which did surprise me as it wasn’t forecast this early in the new day) a lure that would ‘dig in’ and cast well into the head wind was required. Therefore, Steve’s brand new IMA Hound Glide 125F (Plasma Candy colour) was attached. Frustratingly, a heavy rain shower brought an interruption to proceedings (I was concerned about the possibility of lightning) and unfortunately, Steve lost the ‘Glide’ when it became tangled with a huge clump of weed. Added to these complictaions was the fact that it was all very quiet on the bass front. With no action in darkness, I asked Steve to continually cast and move, with one of my Hound Glides, along a 100m stretch of the beach as dawn broke. It looked good – but it remained surprisingly quiet. My ‘battered’ IMA Hound Glide (those hooks are needle sharp despite being slightly rusty). As per my previous blog post – these lures are extremely versatile in that they cast brilliantly and swim consistently in turbulent water. As it became lighter, Steve and I navigated the cliff top path for around half a mile to the next spot – the one that I had high hopes for! 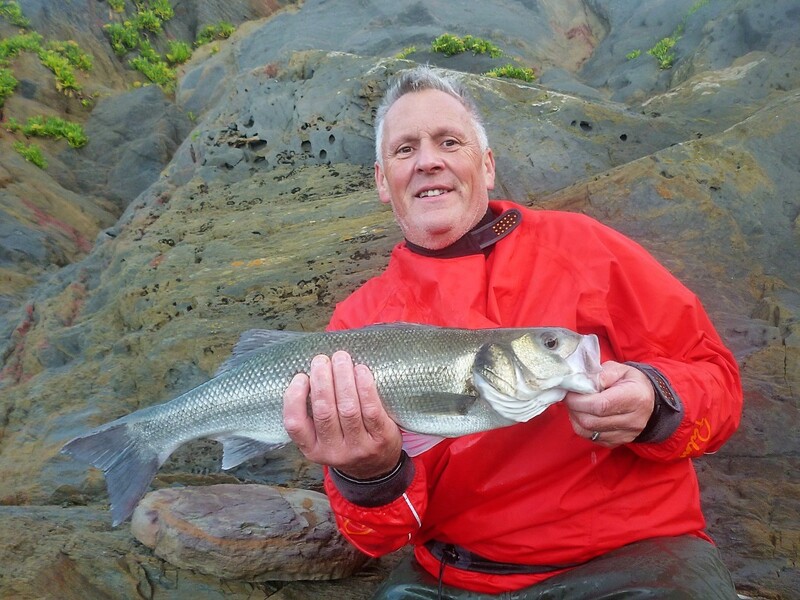 Steve had driven a long way (from the Kent/Sussex area) and had stayed the night therefore, I was delighted he at least found the surroundings so beautiful – but it was the bass that were on my mind! The depth of the water – and is it changing due to the tide? Are there rocks protruding or just under the surface? Reef, weed, sand, shingle or a mixture? Are there deeper areas (gullies, depressions) present? Is there a specific feature (attractive to both bass and their prey) that you’re targeting/casting towards? Is casting distance a factor? Is there white/aerated water present? Are the sea conditions changing due to the wind, tide or swell? Is the tide ebbing or flooding? The amount of current present and the direction it is running. Are there prey items common to that specific mark, such as gobies/blennies, pollack or wrasse. Are the bass in an opportunistic mood and possibly preoccupied with one food source? In daylight – is it bright/sunny, dull/overcast or showery? In darkness – the amount of ambient light present (Moon, stars, harbour lights or even lighthouses! An intermittent swell – encompassing 6 or 7 larger waves every 3 – 5 minutes or so. A strong wind, 15 – 20 mph blowing right in our faces. The light levels were increasing due to the sun rising and the cloud breaking following the rain showers. Large rocks – some protruding above the surface to our left. An area of boulders, just under the surface to our right. An underwater gully (8ft deep) is present here, with (mostly) a shingle seabed, approximately 30m long and 4 – 5m wide – Apologies for mixing up my units of measure! Unusually high numbers of small bait fish and sandeels had been sighted in the vicinity over the previous days. Could be cast very accurately. Could be cast a long distance (up to 30m into a head wind). Wouldn’t be ‘spat out’ by any larger waves. Could handle being knocked about (whilst still looking natural) with the volume of water that was being pushed around the rocks. Looked and swam like a sandeel or small ‘silvery’ fish. The IMA Hound Glide 125F met all of these requirements/criteria during this part of the session therefore, it was for this reason I asked Steve to persevere with this lure and to cast it again and again, continually aiming and retrieving the lure straight up/down the gully. I have extreme confidence in these fantastic lures and I was also confident (based on numerous personal experiences here) that in the two hours the bass would appear as the tide flooded into ‘our’ inlet. There was one final piece of advice that I gave Steve – ensure that you retrieve the lure all the way to the rod tip, as it was very probable that in these conditions a bass would hit the lure in the final seconds of the retrieve. Keep your eyes peeled and concentrate ‘I said’ as I took a few steps back in order to watch everything he was doing, whilst keeping an eye on the waves hundreds of yards out. Steve continually casting into an underwater gully with an IMA Hound Glide 125F an hour after dawn – a very good time for this particular mark. Minutes later he landed a very respectable 58cm bass. For 45 minutes Steve did exactly what was required – arrowing the lure out into the exact area, and retrieving as directed. It was literally a few moments after I captured the photograph above that Steve’s rod was almost wrenched from his grip! I’m not exaggerating! I was stood with the net just behind and to the left of him (from where I took the photo) and it was brilliant to experience it from a guide’s perspective – what a take!!! The bass had swiped the lure around 60cm from the rod tip and was clearly surprised at feeling the resistance but amazingly (although I have experienced this before and it would be interesting to know if this happens to other lure anglers) the fact the fish took so close to the angler made for a very short battle. I think bass are almost so surprised to find themselves hooked that they are somewhat subdued or even stunned?? Balancing precariously on the slippery rocks, the bass behaved impeccably during what was also a brief lull in the increasing swell as I managed to net it – first time! I think I might actually be nearing a standard approaching reasonable with the old net! Get in there!!!! It is a real achievement catching a bass of this size from the shore. Even the bright red kayaking jacket (I’d advise wearing dull colours with reflective strips) wasn’t enough to deter this hungry predator from smashing the lure just off Steve’s rod tip. By the time we’d unhooked the bass, took some pictures and captured the footage above the tide and wave height had made it just too dangerous to remain on the mark – a shame, but client safety is paramount of course. With the tide nearing its peak, I decided a nearby shingle beach offered the best chance of staying safe and dry, whilst enabling Steve the opportunity to add to his tally. Not that he was overly bothered if I’m honest as, by his own admission, he was completely ‘blown away’ with the experience of catching by far his largest bass to date. From the beach, he managed to land two small school bass, one on the Hound Glide and one on a 27g Savage Gear Line Thru Sandeel respectively. The personal experiences (some of which were hidden deep in my bass ravaged brain) and patterns of bass behaviour that I gleaned from my diary entries, undoubtedly assisted in determining exactly ‘where’ and ‘when’ to fish during this session – and that goes for all of the sessions that I plan and facilitate. Bass are 100% creatures of habit and can and will be caught in the same gully or stretch of reef in very similar conditions. Nobody can get it right all of the time of course, and we all have to re-evaluate or overcome certain obstacles when we’re out on the coast. Ultimately though, if you have the time to really ‘learn’ your marks, patterns will eventually appear in your catches, and even in your blanks. It is this knowledge, built on overall personal experiences that will greatly assist you in deciding exactly ‘when’ and ‘where’ to choose the right lure, and cast it into right area, at the right time. Previous Client Catches – Wet and wild bassing!